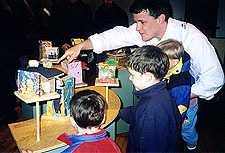 VSA arts first displayed the original 52-box exhibit during the 2002 Olympic games and Cultural Olympiad held in Salt Lake City. VSA Arts invited students with disabilities from all countries to express their own personal ideas, dreams, visions and unique situation by reconfiguring identical boxes into original works of art. Over 6,000 Children were encouraged to use the boxes to create statements about their lives and the places where they live. 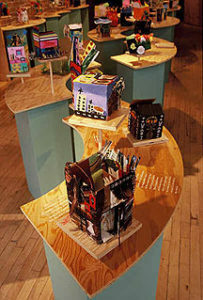 The resulting Children Beyond Borders Exhibition of boxes from over 83 nations and 45 states embraces our differences and highlights the unbound possibilities of children’s creativity. Special guests, IOC Chairman’s wife, Mrs. Annan, and the UN Secretary General’s wife, Mrs. Bovijn visited the exhibition. WBB was selected as one of the top 5 events of the Cultural Olympiad this year. My box creation reflects my passion for abstract shapes and patterns. I love to arrange elements in horizontal lines and use strong, vibrant colors. Kevin Williams – Untitled, Washington D.C.
Art is a personal expression of each child’s ideas, dreams, visions and unique situations. VSA arts celebrates the artistic expression of young artists with disabilities by joining the efforts of the Olympic Winter Games of 2002 held in Salt Lake City, Utah. VSA arts promotes arts opportunities as a place for children with disabilities to experience the esteem of self-accomplishment and build self-confidence. The imagination of a child is capable of spanning any border, whether political, radical, religious, physical or mental. Since its founding in 1974, VSA arts has been recognized by the United States Congress as a Program of National Significance for Arts in Education. One California student changed the box into a grand piano and wrote “I have a piano at home. Mom wants me to play. I go to my teacher Carol’s house and practice. I like my piano teacher. 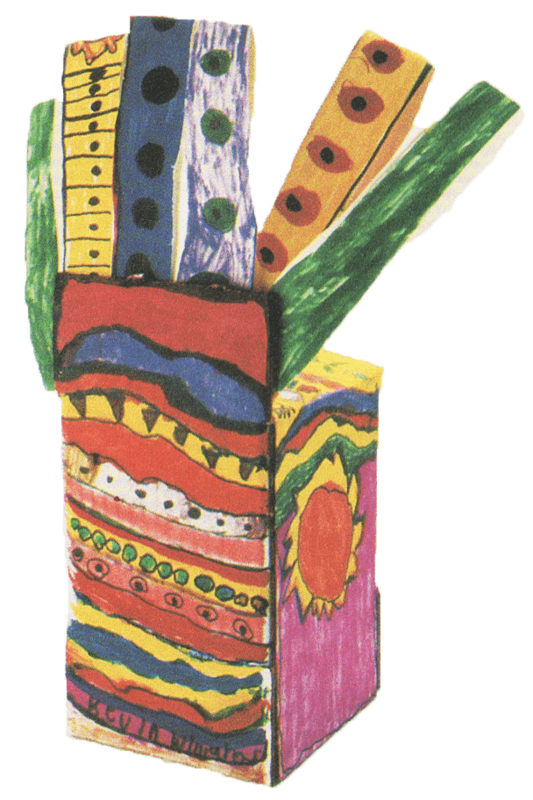 I feel happy when I play.” Another work, created by a student from Utah, features a bright green dragon rising from the box which is decorated with brightly colored bees (a symbol of Utah) and is entitled Flying Peace. VSA arts was founded in 1974 by Jean Kennedy Smith as an affiliate of The John F. Kennedy Center for the Performing Arts, and led by Interim CEO Deborah Stuart, VSA arts is an International organization that creates learning opportunities through the arts for people with disabilities. The organization offers arts-based programs in creative writing, dance, drama, music and the visual arts implemented primarily through our vast affiliate network in 41 states and the District of Columbia and 86 international affiliates in 83 countries. VSA arts programs now serve 4.3 million Americans and 1.3 million people in other parts of the world.